Fans of The Hoff and players of our other Hoff-tastic slot game, Hoffmania, are going to absolutely adore this David Hasselhoff-themed online slot. With the funky music playing in the background; the Hoff-themed symbols and the regular appearances from the Hoff himself, encouraging and congratulating you as you play, you’ll never be able to exit this slot game saying you didn’t get enough Hoff! Although, you don’t have to be a major Hoff fan to enjoy this NovomaticCasino.co.uk online slot, as anyone who enjoys a lucrative and entertaining slot will appreciate it and all of its signature features. Just like every one of NovomaticCasino.co.uk’s online slots, Hoffmeister has some fantastically-designed, tailor-made symbols. The Hoffmeister Scatter symbol has been designed using a unique Hoff-themed font and the Wild symbol is The Hoff himself, smiling at you with his cheeky, lucky grin. Other symbols include: a beautiful fan wearing a t-shirt with a picture of Mr. Hasselhoff on it, a sports car, a speed boat and two Hoff-tastic golden watches. With all of these Hoff-themed symbols, when you play Hoffmeister, you won’t just feel like you’re with him – you’ll feel like you are him! This Hoff-themed slot, brought to you by NovomaticCasino.co.uk, has 5 reels and 10 pay lines which means there are plenty of ways for you to spin paying symbols in winning combinations – and each time you do, The Hoff himself will show up to deliver you a congratulatory message like: “Look at all that cash!” or “Alight! That’s how The Hoff does it!”. With a minimum bet of 0.01, you could be hearing these messages after spending just a few pennies, but you can choose to raise (or lower) your bet, at any time, by using the plus (or minus) symbol next to your bet amount. Moreover, each time you win, you can opt to gamble the winning amount and perhaps you’ll double, quadruple or even octuply it – all you have to do is correctly guess the colour of each subsequent card: red or black! The Wild symbol, Mr. Hasselhoff himself, can substitute for any symbol except the Scatter symbol. Spinning three or more of any of the paying symbols, in a winning combination, in successive rows from left to right, will give you a payout – and the amount will depend on the size of your bet and which symbol(s) you’ve spun. If you spin three or more Scatter symbols, anywhere on the screen, you’ll be given free spins! During your free spins, each and every time you spin a Wild symbol, it will stay wherever it lands throughout the rest of your free spins – this means that you have even more of a chance of winning in these Hoff-tastic free spins! Another great feature from this NovomaticCasino.co.uk Hoff-themed slot is that you’re able to use the double-or-nothing gamble option on any winnings you get during your free spins as well! When your free spins are over, The Hoff himself turns up to tell you: “Congratulations, you rocked this bonus!”. 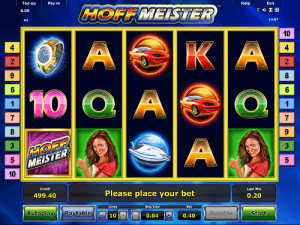 As with most of NovomaticCasino.co.uk’s other great slots, you can play Hoffmeister for free until you’re ready to play with and win real money! Once you’ve got the hang of it and you’re happy with your bet, you can use the ‘autoplay’ function and let the game play for you so that you can win without having to do a thing! If you enjoy Hoffmania, why don’t you try out our other slots and table games, such as: Roulette, Sic Bo, Blackjack and Poker.